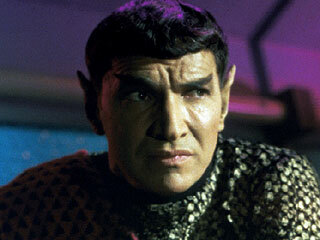 Romulans are thin, severe humanoids who closely resemble Vulcans and humans, with arched brows and pointed ears. They are believed by most races to be an offshoot of the Vulcan race before Vulcans turned to logic. Romulans believe Vulcan to be a lost colony of theirs. They do not possess the telepathic abilities of their Vulcan cousins. face to face contact was made, even during the Romulan war which resulted in the present treaty between the UFP and the Romulan Empire. The treaty designates an area of space between the two factions known as the "neutral zone" to mark their respective borders. Entrance into this area of space by either party is considered an act of war. No such zone exists between the borders of the Romulan and Klingon empires. which results in frequent skirmishes between the two. During a temporary alliance between those two empires the Romulans exchanged their cloaking technology for Klingon warp drive technology, a move that both sides have since regretted. Romulan society revolves around duty. Their society is highly militaristic, but little else is known about their form of government or social structure. They make highly effective warriors who take no prisoners. There is an intelligence arm of the Romulan military known as the Tal Shiar. The exact relationship between this branch and the rest of the government is unknown. They are just as ruthless and efficient as their military counterparts, and utilize an effective assassination segment. Recently factions within the Tal Shiar and their Cardassian counterpart, the Obsidian Order, launched a preemptive strike against Dominion forces on the other side of the stable wormhole that exists between the Alpha and Delta quadrants of the galaxy. The attack failed entirely and resulted in the complete destruction of those forces used in the attack. It was revealed that, at least, one of the Romulans in charge of the operation was actually a Changeling spy who helped engineer both the attack and its defeat. Since then the Dominion has launched a campaign against the Federation inside the Alpha quadrant. The Romulans have signed a non-aggression pact with the Dominion, at least until it becomes clear who will win. Due to their inscrutability in their dealings with other cultures, Romulans are generally viewed with distrust by those familiar with them. The Romulans are so similar to Vulcans it is incredibly easy for the two races to pose as each other. There are a few Vulcan spies apparently working on Romulus, and there could be any number of Romulan spies moving freely within the Federation. The Romulans are a sub-race of Vulcans, that have turned away from the peaceful teachings of their brothers. As a result they harness their emotions in a warlike way and have lost their telepathic powers. Few are force sensitive and even fewer still have regained their telepathic powers or even force abilities. As a result of this the Romulans have cut themselves off from their brothers and tend to stay out of galactic affairs, warning races that they have no interest in dealing with them and to stay out of their sector of space. Those foolish enough to venture into Romulan territories are rarely heard from again.